Marijuana policy reform has been a long time coming. It may seem as though marijuana went straight from criminal to legal in the stretch of a single election, but it isn’t so. Legalization has a deep, remarkable history. The full story started in 1492, when Christopher Columbus brought the first pot plants to North America. But we’ll skip ahead a few centuries to more recent developments. Before the Great Depression, marijuana wasn’t even on the American radar. Farmers had grown it for hemp since the early colonial era; even Thomas Jefferson and George Washington had hemp farms. The drug was popular in parts of Latin America, including Mexico, but it wasn’t widely used in the United States until the early 20th century. Its use by Mexican immigrants quickly convinced Americans it was a dangerous, degenerate drug, and states started banning it out of racism. Then, in the 1930s, a man named Harry J. Anslinger went on a tear. Anslinger served as head of the Federal Bureau of Narcotics, the predecessor to the DEA, from 1930-1962, the longest reign of any federal anti-drug chief. Within less than seven years of taking office, he managed to convince Congress to completely ban cultivation, sale, and possession of cannabis. 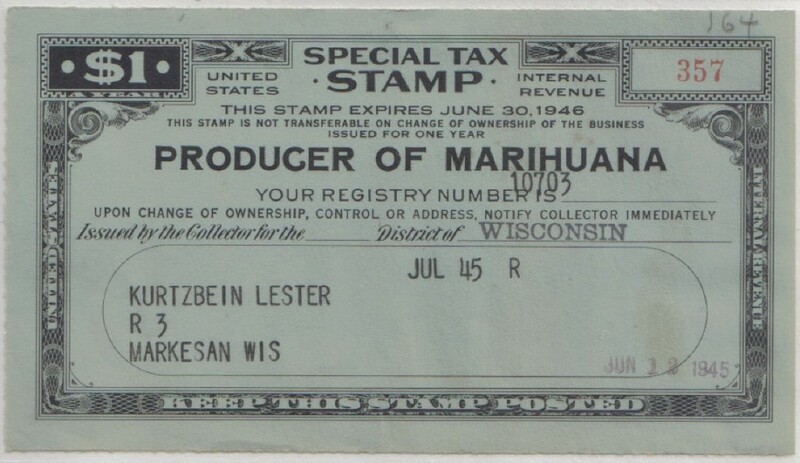 The Marihuana Tax Stamp Act of 1937 criminalized a large segment of the population in one fell swoop. The Tax Stamp Act required anyone who hoped to sell cannabis to pay a tax and get a license. However, the law was designed so it was practically impossible to do so (with the exception of during World War II, when the feds actually encouraged hemp production). Selling pot without a license was treated as tax evasion and could draw a substantial prison sentence. States banned marijuana under their own laws in a process that started well before 1937; Massachusetts was the first to do so, in 1911. By the time Ansinger’s law took effect, the drug was illegal everywhere in America under both federal and state statutes. Things changed during the early 1940s, when the feds actually encouraged farmers to grow hemp, which was badly needed for the war effort. For years afterwards, the government denied any of it ever happened, until some pro-reform celebrities discovered a long-lost videotape that proved otherwise. In 1969, Americans almost got a taste of real legal reform. The Supreme Court tossed out the Tax Stamp Act, saying it violated the constitution by forcing people to incriminate themselves when asking for a tax stamp. That changed in 1969, when the U.S. Supreme Court overturned a high-profile drug conviction, ruling that the Tax Stamp Act was unconstitutional. The fun didn’t last, however: The next year Congress and President Richard Nixon enacted the Controlled Substances Act, a harsh statute that declared marijuana to be among the most dangerous substances in the world. The Act organized various legally controlled substances into “schedules” according to how dangerous, addictive, and medically useless Congress considers them to be. Marijuana has always been in schedule 1, the most highly restricted category, along with ecstasy and heroin. And that’s where things stood for nearly 30 years. Then, in 1996, as public support for legalization began its slow climb out of the basement, Californian voters passed the first medical marijuana law in the world. Several other states followed suit within the next few years. Unfortunately, the federal government didn’t get the memo: The DEA and federal prosecutors continued to arrest and incarcerate innocent low-level marijuana patients and providers. The anti-weed campaign even picked up speed as support for legal pot crossed the 50 percent threshold. By 1996, reform looked promising to more Americans. Legalization wasn’t a popular idea yet, but it was starting in that direction. That November, voters in California approved the first legal medical cannabis program in the world. Other states soon followed suit, and by 2012, MMJ had become an established reality. What came next couldn’t have happened without that change. Colorado and Washington were the first states to legalize the recreational use of marijuana, and numerous others have followed suit since. In November 2012, Colorado joined Washington to become one of the first two states to legalize marijuana for recreation. Amendment 64, the legalization initiative, passed by a wide margin: 55 percent to 45 percent. The new law allows purchase and possession of up to 1 ounce of cannabis per person, while residents may grow up to four plants at home. Amendment 64 also imposes regulations and a sales tax on the legal marijuana industry. Uruguay became the first country in the world to legalize cannabis use nationwide after President Jose Mujica signed legislation allowing adult use of the drug. The law allows adults 18 and older to grow, possess and consume cannabis, and made cannabis obtainable through a state-controlled marijuana dispensary system. Canada became the second country in the world to legalize recreational cannabis use nationwide on 17 October 2018. The biggest victories in marijuana history may yet be to come, though. Momentum for marijuana reform is an almost unstoppable force now. Public support continues to rise, we’re seeing an increasing number of people in the public eye advocating for policy reform, and the availability of cannabis is continually increasing. Legal marijuana is here to stay.